Z3DModelView software is designed for three-dimensional visualization of of one- or two-dimensional interpretation results from Zond software packet. In geophysical surveys, measurements usually got by a system of parallel lines. To better understand the structure of the site works such data useful to display in three dimensions. This allows us to effectively correlate structures for parallel lines, compare perpendicular lines at the intersection, to display the horizontal sections for a given depth. There are many graphics packages, which can solve this problem. Unfortunately, the use of these programs require the user to a specific experience and skills, and even an advanced user you want to make many manipulations before receiving the final result. In the process of interpretation the model is frequently changed, so Z3DModelView provides the possibility of line’s set rapid repainting. The software allows you to build a system arbitrarily oriented sections taking into account topography, define the XY coordinates of sections, display XY cross-section for a given depth. 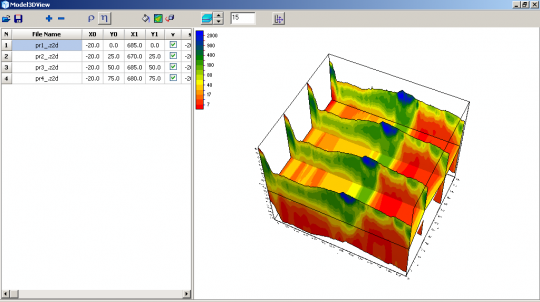 The program provides two types of display sections – in the form of contour maps and interpolation. The scheme of profiles can be stored in a graphical format. The software also allows you to export the schema profiles or horizontal slice in the text file.